beautiful hotels in the country thanks to its exceptional setting. 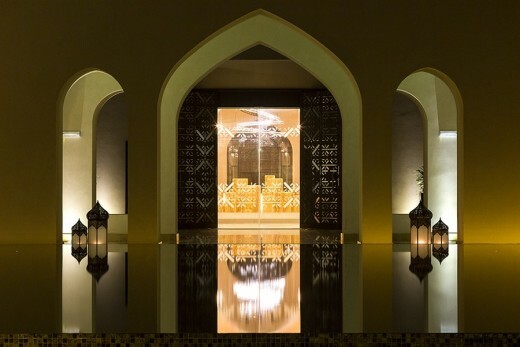 were completed in early 2015.
generous openings and moucharaby latticework. 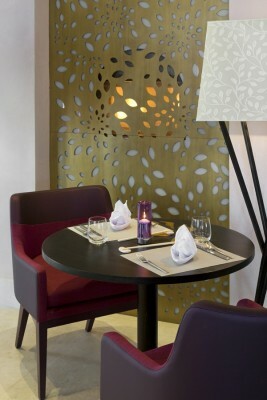 allows him to develop a contemporary approach that is in symbiosis with the country’s traditional culture. 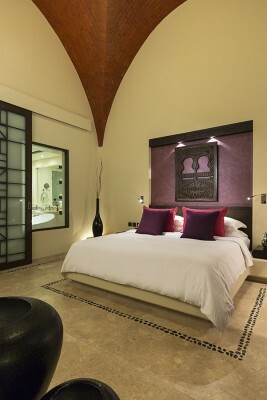 touch of character to the rooms, in particular the window decorations in the typical Omani style. built with local stone and all the works were carried out by craftsmen from the region. much as possible our carbon footprint,” explains Galal Mahmoud. 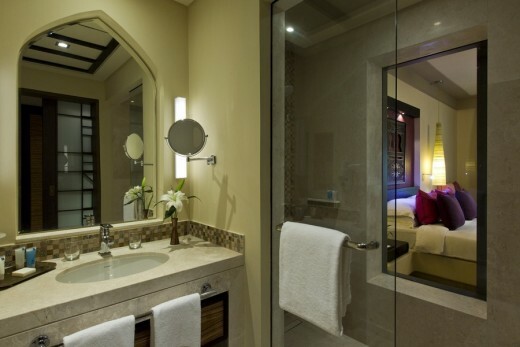 All the rooms have either a balcony or a patio so hotel guests can enjoy a magnificent view of the Arabian Sea. sublime pool of mirror-like quality. 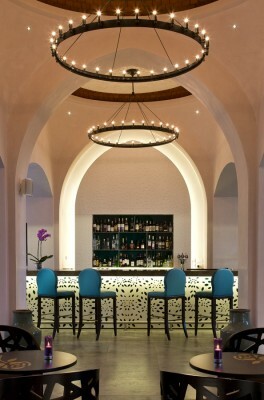 Arts and crafts sourced from local markets give the reception area an authentic feel. is referenced in abstract graphic pendants. which put hospitality first above all considerations. 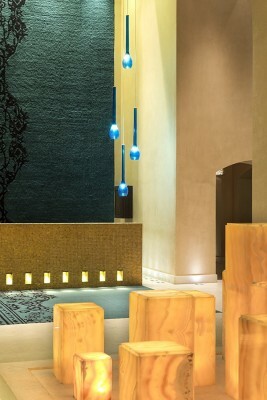 What drew you to this project for the hotel resort in Oman? Are you familiar with the country? I’m interested in all countries that are steeped in culture and history. This is the case for the Sultanate of Oman, a country which attracts me both on a personal and professional level. So it was a pleasure to be able to say yes to working on the interior and exterior design of this five star hotel resort. I was also very much taken with the hotel’s setting. Salalah is the second largest city in the Sultanate of Oman and the capital of Dhofar, one of the prettiest regions in the country. 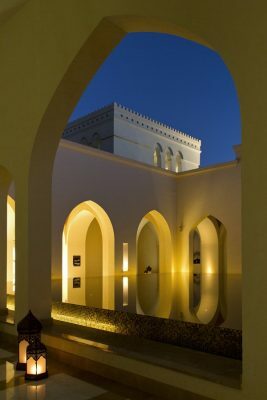 Oman’s natural sites and cultural heritage attract many tourists. 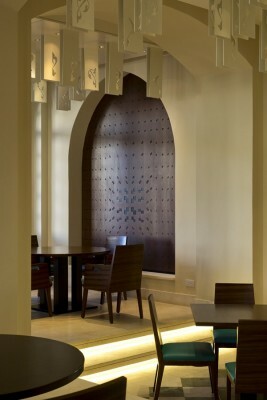 The Rotana Salalah stands on the shores of the Arabian Sea, at Salalah Beach. It’s really interesting for an architect like me to work on a project such as this, in such an exceptional setting. Did you study the site before starting work on the hotel? Visiting the site in person and immersing myself in the location is at the heart of my philosophy. It is a very important concept for me, an approach that I like to call “contextual immersion”. For each project I make a thorough study of the site and the surrounding landscape, including local culture and history, in order to integrate contextual references such as climate, geography and even topography. It ensures a certain respect for the identity and culture of the place. 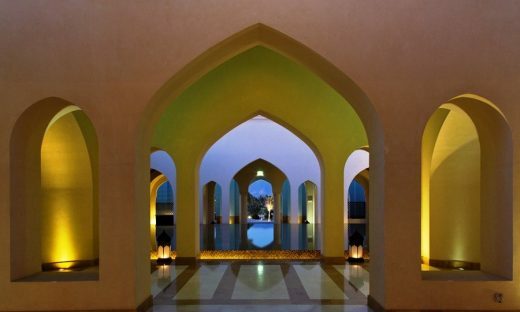 When it comes to the Rotana Salalah, this approach really did drive my work. I took the cultural references of the Sultanate of Oman and reinterpreted them in a contemporary language, and then integrated them into the final design. Omani architecture, with all its arabesques, arcades, balustrades and arches, and the warm colours of the country were an essential source of inspiration for me. What choices did you make for the interiors? 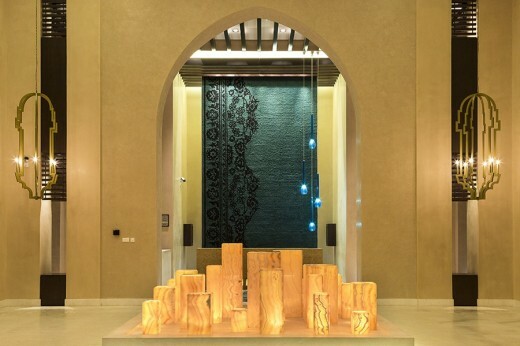 For the Rotana Salalah we decided to refine to the utmost the notion of interior design by making proportions and materials our priority. 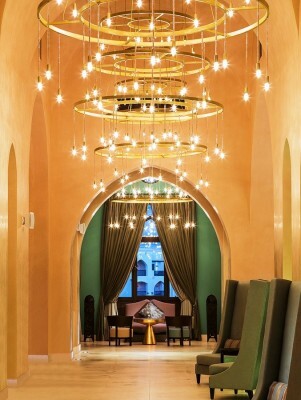 We wanted to adopt a local style and retain the influence of Omani architecture on both the interior and exterior of the hotel, albeit in a modern and up-to-date way. The design’s guiding principles can be found in the objects that were carved especially for the project and in the latticework doors, whose transparency is greater than traditional moucharaby. 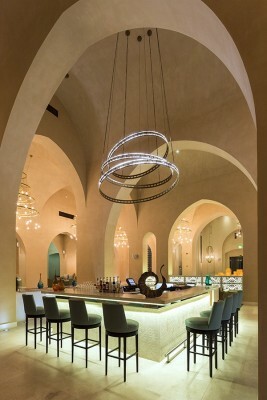 The idea was to recreate a sense of desert hospitality, a tradition particularly dear to the inhabitants of the region. Thus guests can discover in the various areas of the hotel a warm and friendly world of warm colours, subdued lighting, colourful fabrics, draperies and window seats. 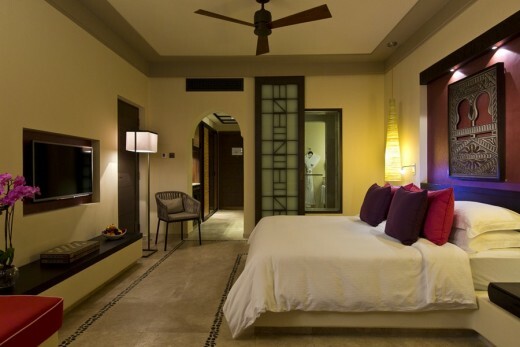 All the rooms have either a balcony or a patio so that hotel guests can enjoy a magnificent view of the Arabian Sea and experience the unique lifestyle of the region. Born to Egyptian parents and having an English grandmother and Lebanese citizenship, architect Galal Mahmoud lived in France for several years, after fleeing the civil war in Lebanon with his family in 1976. He graduated from the Ecole d’Architecture de Versailles in 1986, opening his first architects’ practice in Paris the following year. 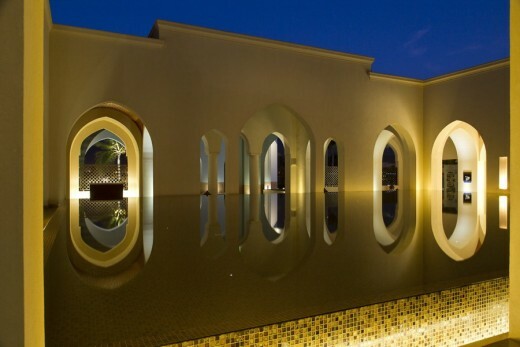 In 1996 he founded GM Architects in Beirut, specializing in the luxury hotel and upscale seaside resort markets. During his many trips to Asia, Galal Mahmoud experienced true well-being and witnessed at first-hand Asian societies’ approach to living in the shape of lifestyles that are equally comfortable in an outside environment as inside a house. Galal Mahmoud takes this approach and fuses it seamlessly with the architecture ‘for living out the good life’ that is so characteristic of the Mediterranean region. These experiences are at the root of Galal Mahmoud’s philosophy and approach to architecture, where the concepts of ‘well-being’ and multiculturalism are key. in France, Africa, the Middle East and throughout the Mediterranean region. before winning an ‘International Architecture Award’ in 2015. Galal Mahmoud’s culturally diverse background has naturally led him to adopt a multicultural approach to all his projects. with a unity of vision, one that is genuinely informed by its immediate context. the identity and culture of the location in question.